Kramer Lux yarn comes in 10 beautiful shades and is unique to Hobium Yarns. You’ll need to order it from them in your favorite shade to get started. If you need to purchase the supplies for this project, feel free to explore my recommendations below! 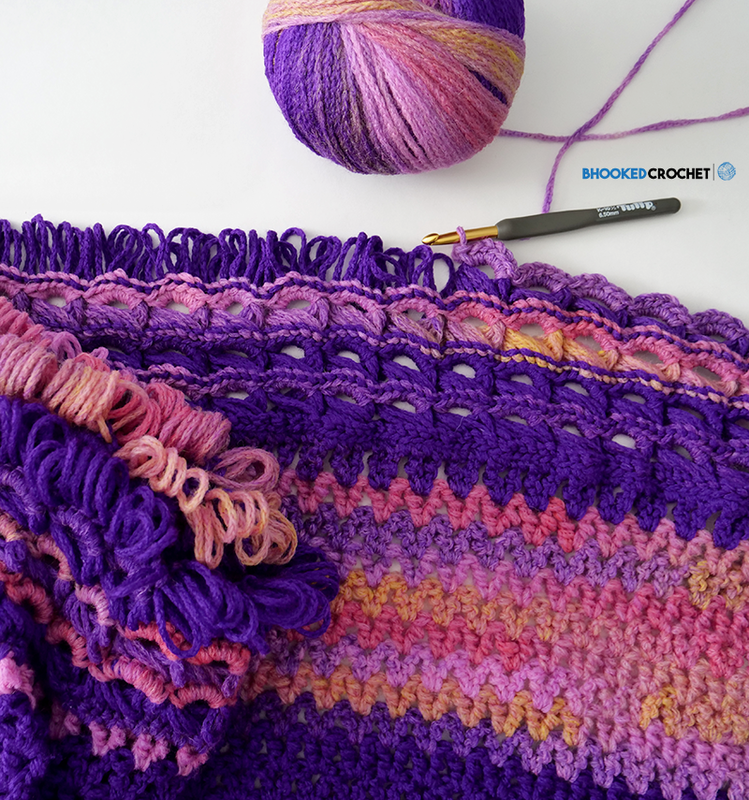 Stitch Guide: Broomstick stitch – The broomstick stitch requires two steps to complete one row, a loop step and a crochet step. Insert your hook into the first chain or stitch and draw up a long loop. Place this loop on the knitting needle with the working yarn at the front of the work. 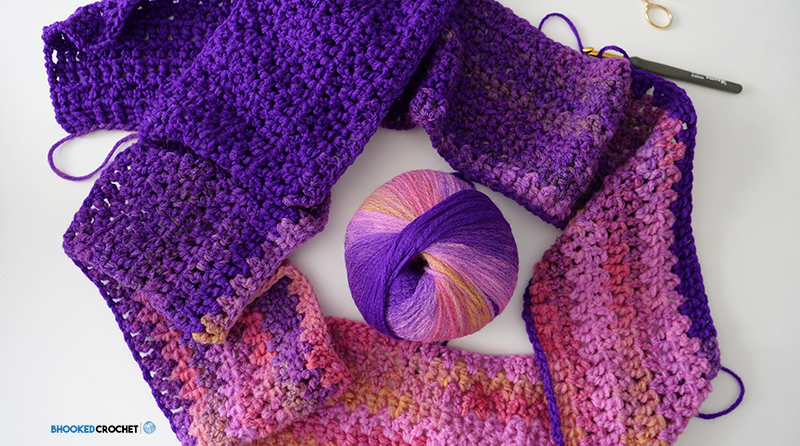 Continue drawing loops through the chains or stitches and placing them on your hook until you have reached the end of your row. Move the working yarn to the back of the work. Count the first 6 loops and insert your hook from right to left underneath all 6. Sc 6 times around these 6 loops. Pick up the next 6 loops just as before and sc 6 times across the top. Continue to the end of the row. 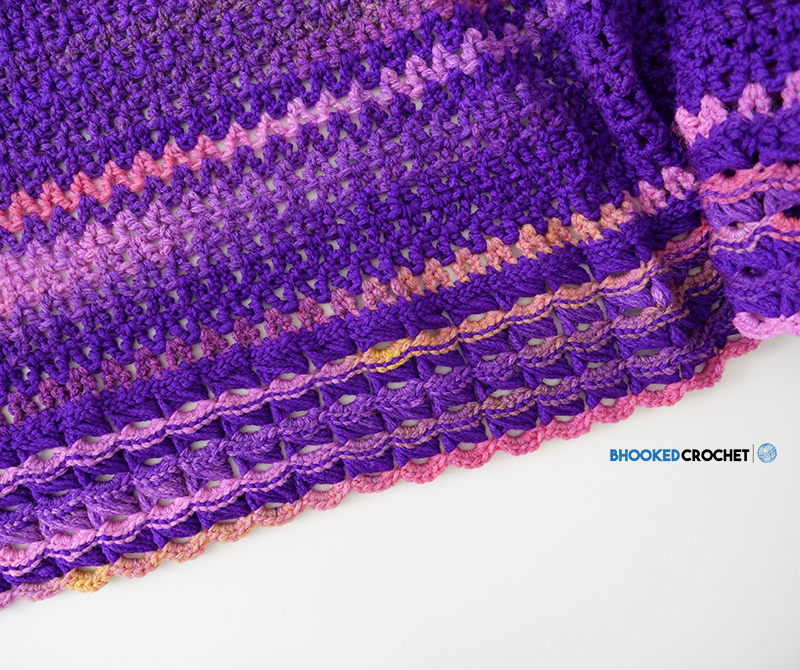 Your finished crochet shawl will measure approximately 16″ wide and 110″ long. The Kramer Lux Crochet Wrap is a great way to keep your shoulders warm on those chilling spring and fall evenings. With 10 different shades to choose from, you’re sure to find a colorway that’s perfect for you. Your knitting needle will not be big enough to hold all of loops in the broomstick lace step. You can carefully remove the loops from your needle when it is full, being sure to replace the last 10 or so to maintain a steady tension. These “live loops” will stay in place with care. Do not pull on them. 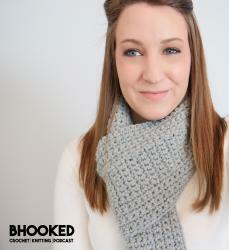 Currently, this project is available in a written pattern only. If you need assistance with broomstick lace, I recommend you check out the tutorial for one of my other projects, the Broomstick Lace Infinity Scarf. The technique used here is the same, the only difference is that we are grouping sets of six loops rather than five. Row 1: Ch 250. Tc in 5th ch from hook and in each of the next 2 ch. Sk one ch, make 2 tc in next (later referred to as two tc group). * Sk one ch, 2 tc in next. Rep from * to last 4. Sk one ch, tc in each of the last 3 ch. Ch 4 (counts as tc) and turn. Row 2: Tc in each of next 2 sts. *sk 1 st and make 2 tc in space between two tc group (from previous row). Rep from * to last 3. Make one tc in each of the last 3 sts. Rep last row 15 more times. Next Row: Ch 1 (does not count as st). Sc in same st as ch 1 for your first st. Sc in next 2 tc. *Sc in next tc, sc in space between two tc group, sc in last tc of that two tc group and sc in space between this group and next group. Rep from * to last 3 sts. Make one sc in each of the last 3 sts. Pull up the loop from your last sc and place it on the knitting needle. Be sure to orient your working yarn so that it is in the front of the needle. Pull up your slack so you have a snug tension. Insert your hook into the back loop of the next stitch YO, pull up a loop and place that loop on your knitting needle. Repeat for all sts. Your knitting needle will not be big enough to hold all of loops for the entire length of the shawl. You can carefully remove the loops from your needle when it is full, being sure to replace the last 10 or so on the needle to maintain a steady tension. These “live loops” will stay in place with care. Do not pull on them. Secure the first 6 loops from the needle onto the index finger of your dominant hand. With your working yarn coming from behind, insert your hook into the group of 6 loops from the left side. YO and pull up a loop, YO and pull through the loop on your hook. This will lock the stitch in place. Ch 1. Sc 6 more times into the gap. *Grab 6 more loops, making sure to keep them in order and insert your hook in the same fashion as before. YO, pull up a loop, YO and pull through the first loop on your hook. YO and pull through both loops (Counts as sc). Sc 5 more times into the gap space. Repeat from * across. Rep last two rows three more times. Fasten off and weave in your ends. I also recommend you block your shawl to open up the lace pattern! I am not so good at crochet, but I have made 3Granny Shawls. I am not sure if I could do this pattern. 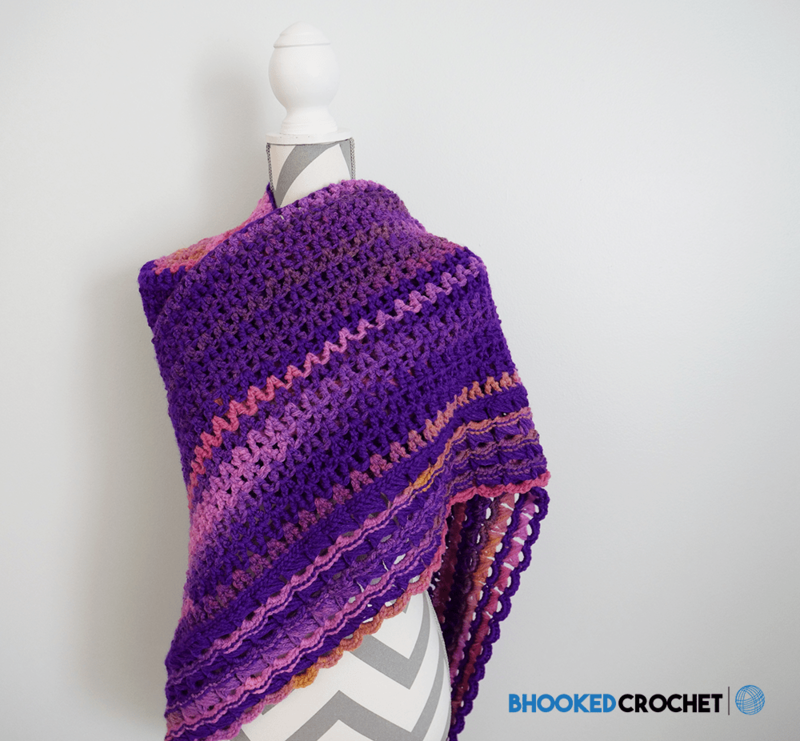 I love the granny shawls and would love to do this wrap. This wrap is absolutely beautiful! 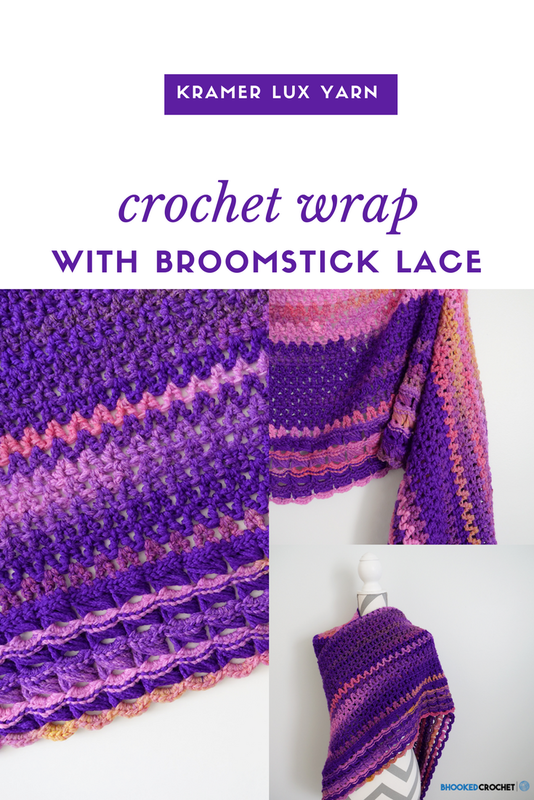 I can’t wait to try to make the broomstick lace. Thanks for providing us with such fantastic creations.